China (mainland) Guangdong Guangzhou,No. 128, Xiongguo West Road, Shenshan Mountain, Jianggaozhen, Baiyun Disctrict Guangzhou, China. 200 frequencies spots, infrared automatic selection function from one key. Humanization design, easy to assemble and operate. PLL Dual module locked loop design. 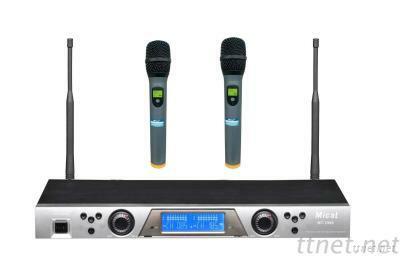 Adopt digital pilot frequency anti-interference technology for KTV box multiple frequency use. White LCD display, very clear. Plastic panel, sophisticated technology, unique appearance. Excellent shock absorber design, protect damage or break. Adopt super cardioid frequency response moving pickup. Low consumption of electricity (Battery can be durable). audio source deviate from the cartridge.